That didn’t take long! Fast to weave and I found an interesting way to assemble that also added about an inch to each seam so makes the shawl a bit bigger for my single ball of yarn. Found this purple in my stash for the trim and like the way it looks. Took 15 triangles. I left the tip off as I really don’t need an arrow pointing ‘there’. The join, in case you’re liking that, is a 5 stitch dc shell. Since I used the 14″ Tri it worked out this way: On the short side: 2 sc, skip 1 loop, *shell, sk 2, slip stitch, sk 2* but you’ll need to adjust for your size. It’s the same basic thing so not a problem how many you skip or don’t skip. To join, work the same thing but dc 3 then slip your hook out and into the center stitch of the opposite shell and draw the loop though, then dc two more to finish the shell. Try to keep the right side up, which I failed to pay attention to at first, but it really doesn’t show much in the shawl unless you really look for it. I finished the shawl edge with a row of sc and a row of reverse sc in the shawl yarn and the top edge is just dc adjusted to lay flat. 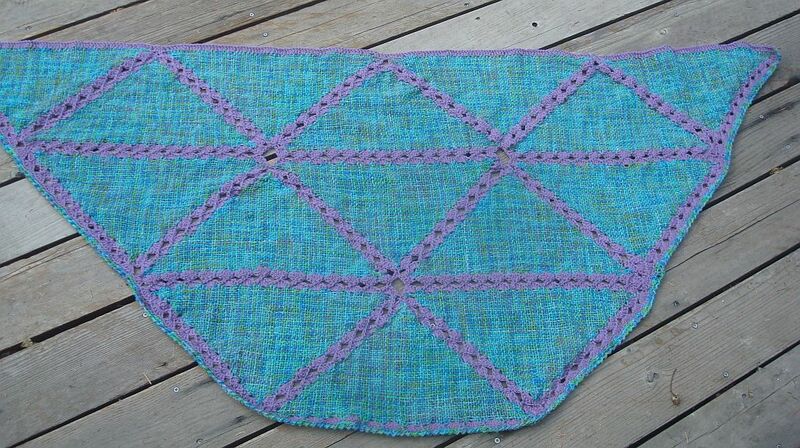 My shawl measures 62″ wide by 30″ deep. My yarn, a soft merino, had a lot of draw-up so my tris are about 11″ on the side. Yours will likely be larger depending, of course, on your yarn and weaving tension. The shell join adds about an inch to each seam. Okay, your turn. A quick project for summer to have you ready for fall! Yeah, that’s what it needed. That’s beautiful. How big does it measure? I added the measurements to the post above. Thanks for reminding me. 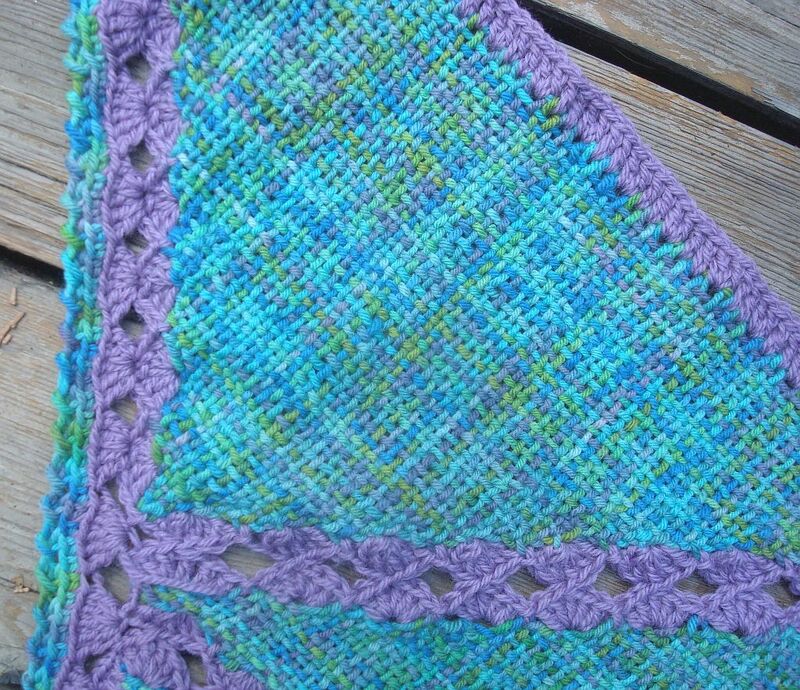 I have had emails from weavers wanting to weave this shawl. I hope to see pictures from them all! Lovely and inspiring! Love the join.